ECE develops Hardware-in-the-Loop (HIL) simulators, comprised of a customized hardware platform that emulates the physical interface of the control module to the full system. This type of simulation environment closely approximates the dynamic stresses that the controller software will encounter within the application and facilitates a substantial improvement in the quality of verification coverage that can be obtained at the bench-top level of investigation. 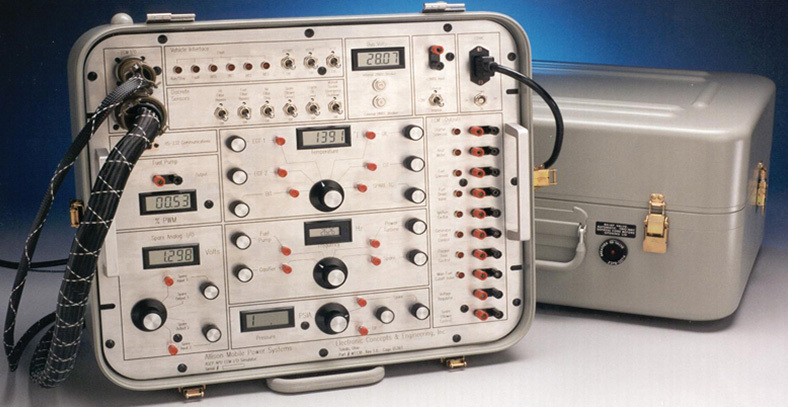 This allows real-time validation of the controller and accessories before performing expensive real-world testing. During HIL simulator design, ECE utilizes the V-Model process with MATLAB® & Simulink® for control system development using rapid-prototyping methodologies. Plant and controller mathematical models are initially developed and studied within the MATLAB®/Simulink® virtual environment to confirm control system response, then transferred to the HIL environment for verification on the target controller hardware. The virtual Plant model used during development is readily converted into a real-time software model that runs on the HIL hardware platform as a high-fidelity emulated version of the real-world plant. 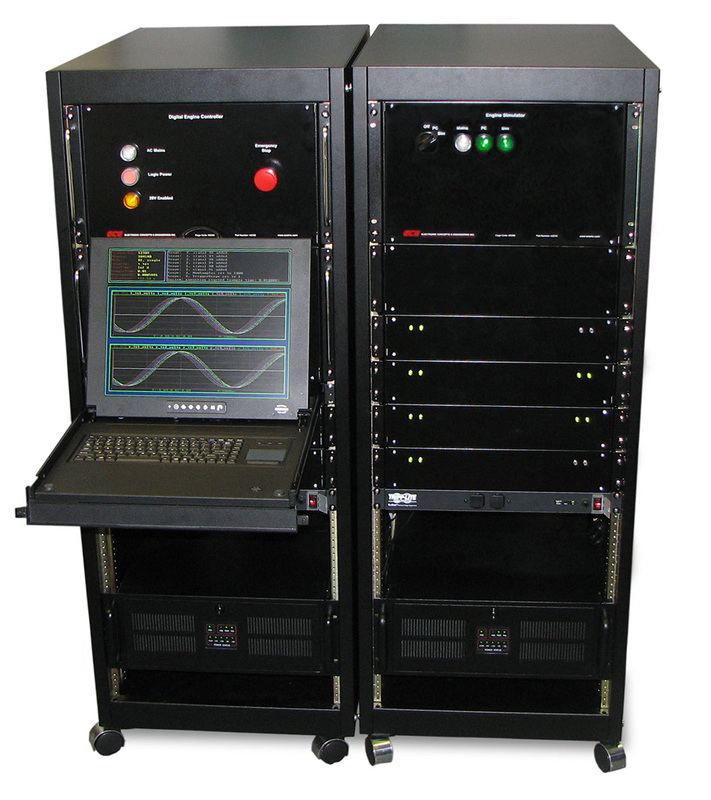 The HIL software model runs in full 64-bit floating point computation and interacts with customized HIL hardware to produce physical signals such a pressure, RTD, thermocouple quadrature, VR Speed / Frequency, 4-20mA current loop, and other I/O as needed. The hardware-in-the-loop simulator allows expedited controller development while the physical plant hardware (e.g. engine, transmission, avionics) is being readied. Variations in plant or control specifications can be quickly modeled, easily evaluated and studied in real-time operation. As an important safety feature, the HIL permits the controls developer a repeatable way to safely test all fault injection responses to the Plant or Controller model and examine sensor error or loss. Extreme operating conditions or failure modes can be easily tested and documented without risking damage to one-of-a-kind prototype hardware or placing system developers in harm’s way. 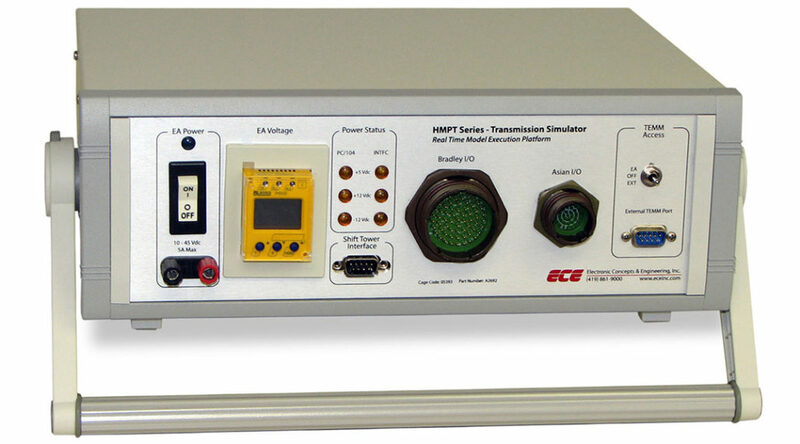 ECE has developed Real-Time Hardware-in-the-Loop (HIL) simulators for DOD missile, vehicle, and ground-power programs.